We led or co-promoted a number of successful marches–Women’s March on Prescott, March for Our Lives, Martin Luther King Peace March, Earth Day, Candlelight Vigils, Keep Families Together, Get Gosar Gone, Frontier Days, Pride Parade, Support the Equal Rights Amendment, Rise for Climate Change, GOTV Rallies and Nobody is Above the Law! Prescott Indivisible participated in Prescott College’s Expos, and have worked with and support a number of state-wide and community organizations–Keep Dirty Money Out of Politics, Planned Parenthood, CWAG, the Sierra Club, Move to Amend, Mom’s Demand Action for Gun Control, the Phoenix Restoration Project, Northpoint Expeditionary Learning Academy, Coalition for Compassion and Justice, Greater Yavapai County Coalition, Yavapai Co. Young Democrats, Keep Prescott Together and activities of the Granite Peak Unitarian Universalist Congregation. We drafted and voted on Procedures for Endorsement in the Prescott Indivisible Guidelines and supported the candidates we endorsed by canvassing and phone banking, postcard writing and by donation. We designed and printed a business card with instructions on how to register to vote online in English and Spanish. We tabled many events on the square, registering people. Election Team members worked with nextgen AZ and many others also volunteered for the Yavapai Democratic Party Coordinated Campaign. We supplied the campaigns with very popular handouts with a complete list of candidates and proposition facts (3,000 distributed). One of our members, David Brill, ran for CD4 House of Representatives. It took an act of courage to run for office the reddest district in the state. Brill, his family and campaign staff did everything possible to reach out to the citizens of the district. Prescott Indivisible members were a huge part of his volunteer effort. Prescott Indivisible continued its resistance tactics in 2017-2018, but emphasis was placed on electoral activism in 2018. We withstood complaints that PI was becoming partisan by standing up for the values we advocate, now featured prominently on the PI website. What we learned in 2018 will only help us to keep up the resist-by-advocacy strategy that will be put to the ultimate test in 2019 through to the 2020 election. Prescott Indivisible is recognized for our consistent approach and team efforts by national Indivisible. Ezra Levin, one of the founders of Indivisible, visited Prescott in October for the ballot drop. Two of Indivisible’s (Washington) staff came to the city to canvass for the Brill campaign. Tricia Sauer, our AZ Indivisible Organizer, keeps us informed and is our “cheerleader,” who has insured our visibility to national Indivisible. Prescott Indivisible’s teams work constantly to stay on top of issues. The Immigration Team has sponsored eleven DACA Scholarships for Dreamers and is involved in outreach to the Hispanic community. The Human Resources Team works with Planned Parenthood, GYCC and other community organizations and organized the call-in campaign against Kavanaugh. In addition to partnering with CWAG, the Environmental Team spearheaded a successful postcard campaign re palm oil. Read this article about the devastation this industry has wreaked on Indonesia. The Education Team has worked tirelessly with #RedForEd, No on Prop 305 and has worked with the other education groups in the community and Move to Amend to keep us informed and make a difference for our educational system. The Communication and Events Team is responsible for the prescottindivisible.org website; a weekly newsletter (Prescott Indivisible Newsletter and Persist and Resist alternate weeks); press releases re events and meetings and two calendars–all the Indivisible events and meetings are on the website calendar and a weekly community calendar of progressive events are part of the newsletters and also available on the website. Our YouTube Channel has edited videos of meetings, rallies and other important events. 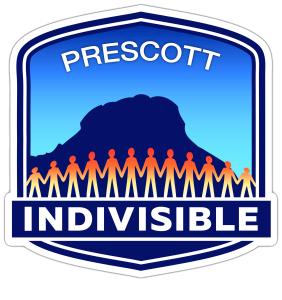 Prescott Indivisible has made efforts attract new members and increase member participation by sponsoring community-building activities such as pre-march paint-ins; monthly General Meetings designed to inform and inspire members with invited speakers of local interest; annual picnic and candidate forum; and occasional training seminars (OpEd writing, canvassing/voter registration and special interest presentations).